During my pregnancy, I was looking around to find amazing quality cloth diapers at a great price for my new baby. I came across Glow Bug Diapers online and contacted them. I received the opportunity to review one of their diapers. 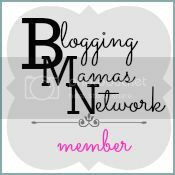 Glow Bug Cloth Diapers was founded by two mom friends in 2011. These diaper's design is so unique in the industry. Glow Bug Cloth Diapers are sold only in packages. When I received the diaper, I was surprised with the great quality it had. Glow Bug Cloth Diapers have four size settings to fit from birth to potty training. They have double rows of snaps with square tabs and two sets of crossover snaps to fit small babies. The top shows the diaper on the smallest setting where the bottom show the diaper on it's largest setting. I love the 360 degree gussets that helps prevent leaking. They have an opening on both ends of the diaper which makes insert stuffing easier. My favorite feature about this diaper is how the insert snaps into the diaper, keeping it in place. Glow Bug Diapers truly fit from birth. They have a nice, trim fit on my 7 lb newborn. The 360 degree gussets are great for his skinny little legs. No leg gaps, super trim and no leaks! To be honest, I really did't find anything that I did't like about the diaper. I would recommend Glow Bug Cloth Diapers to anyone and will be adding more to our stash! 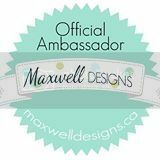 Shop Glow Bug Cloth Diapers HERE! Find Glow Bug Cloth Diapers on Facebook! 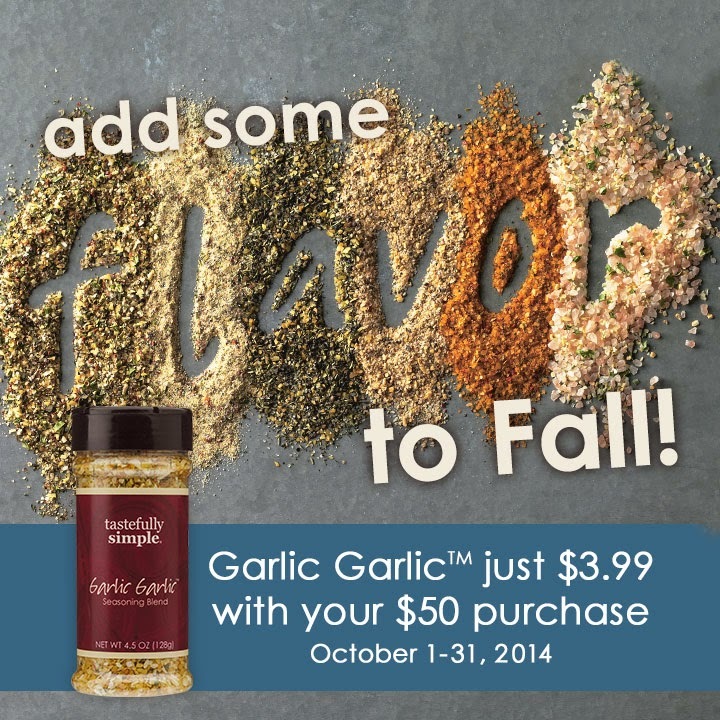 Disclaimer: I was given the products in this post for the purpose of my honest review. I was not paid in any way to write this review. 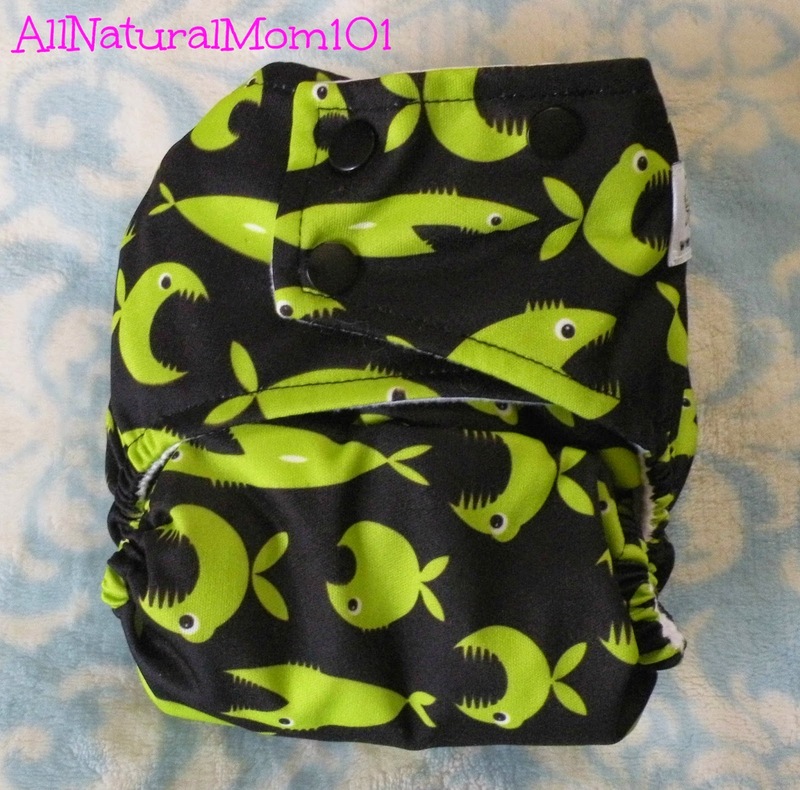 Review & giveaway is Sponsored by Glow Bug Cloth Diapers. 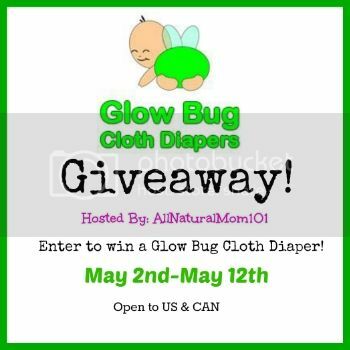 Welcome to the Glow Bug Cloth Diaper Giveaway sponsored by Glow Bug Cloth Diapers and hosted by All Natural Mom 101. 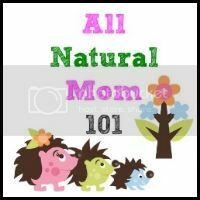 One lucky reader of AllNaturalMom101 will win one(1) Glow Bug Cloth Diaper. Winner chooses boy, girl or gender neutral print. The Giveaway Starts May 2nd-May 12th. Open to US & CAN residents only. I'd choose girl but this fish diaper is just TOO cute! I'd go boy print! I hope it's one of their brand new prints! All of that new set is gorgeous! I have a boy, but I would choose gender neutral. I like having something next baby can wear!